A former NCAA college-level athlete and current competitive marathon runner, Robyn believes in the strong role that the mind plays in sports and exercise performance. Fitness is a key component to stress reduction in today’s busy world, and as a fitness professional, she combines a positive attitude with challenging exercises to meet her clients’ needs – all of which begin with simple goals. She inspires her clients to eat clean, train hard, and finish strong! Along with attaining her B.S. 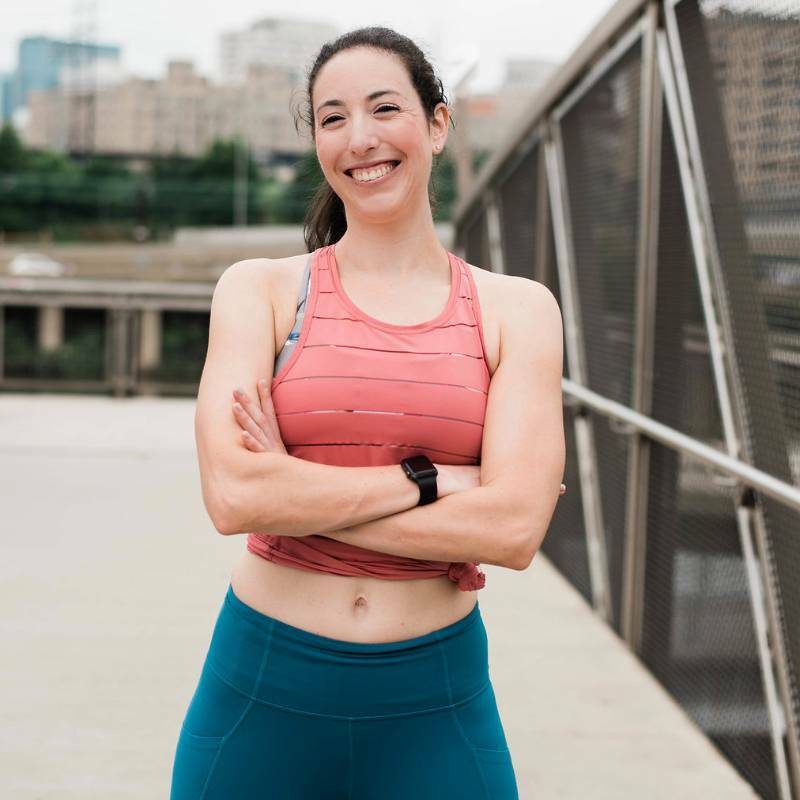 in Exercise Science/Physiology from Towson University, Robyn is a certified personal trainer through the American Council on Exercise, and she also provides nutrition counseling. She does not believe in a “one size fits all approach” when it comes to implementing a fitness program. Rather, her goal is to create a tailored program that incorporates physical and mental components specifically geared toward each client’s individual needs. Her specialties include general health and fitness improvement, weight loss/body shaping, pre/post natal, bridal prep, special events and sports-specific training. Start training with her today to start building the blocks toward the results you want! I trained with Robyn after I had my baby to get back into shape. She was amazing! I learned so much about core conditioning and switching up my workouts. Training with Robyn is a great workout. She makes sure that the workout is always different,but manages to challenge me every time. She is patient and pleasant in every session. She always asks me if I am having any problems before the workout. She has made me really enjoy my training with her. Robyn is a great trainer! I've trained with her over the last 3 weeks, after a major surgery and not exercising for a while. Already, I feel more energetic and my body makes progress. Robyn always adapts the training pace with my situation and encourages me to push boundaries. I never thought that I would be able to run non-stop for 10 minutes. But with Robyn, I made it after just a few training sessions. I will continue to train with Robyn and look forward to achieving my goals within the next few months! I really enjoy working out with Robyn. She challenges me each week with different workouts that push me harder than I know I'd ever push myself. She has a great attitude and I appreciate her flexibility with my changing schedule and willingness to come to my apartment. I look forward to her session each week because I know I am guaranteed to get a great workout. I have been training with Robyn for over a year, and I am in the best shape of my life (just turned 40 and feel like I am 20). Robyn is extremely knowledgeable about personal training, and she stays up to date on the latest techniques and approaches. Regardless of your age or fitness level, Robyn is the trainer for you! Robyn is a Find. I liked Robyn as soon as I met her. She was punctual and took just the right amount of time getting to know me and my goals before we got started. Robyn's a great listener, pays attention to details, is knowledgeable and shares her knowledge quickly and clearly. Her energy and generosity of spirit and support seem to come naturally to her and I look forward to our future workouts. I feel certain I'll be able to achieve my goals in weight management and physical endurance with Robyn's guidance. I see Robyn 1-2 times a week and she's great! She does a great job switching up my workouts to keep me using different muscles and has a really good total body approach to exercise- I leave feeling like I targeted parts of my body I couldn't get to on my own which is awesome! Energy. Power. And Patience. That's Robyn. And I'm so glad I found her. She's taught me that working out doesn't have to be a chore. My time with her flies, because of her constant energy, positive reinforcement and because of the special attention she pays to me. She helps me focus on my own challenges, and works with me toward accomplishing my own specific fitness goals. I'd recommend Robyn to absolutely anyone and everyone. I have been training with Robyn to get in better shape for my upcoming wedding. I have never really been motivated to work out, but I find myself looking forward to, and really enjoying the workouts with Robyn. The workouts are different every week, and I have gotten much stronger and closer to my goals since I started training with Robyn. Outstanding Workouts Tailored Just For You. Robyn has been working with myself and my fiancee getting us in great shape for our upcoming wedding. We have seen tremendous results in our overall fitness since working with Robyn a few months ago. Robyn accurately assesses your baseline in the first workout sessions and then tailors each workout to your specific needs and challenges you to get healthier and stronger with each workout session. Robyn travels to our apartment gym and works with our schedule to make these sessions happen. My fiancee and I have different workout needs and Robyn understands exactly what each of us need to do differently to achieve those needs. We are so happy to have found Robyn and I highly recommend hiring her! I've been working out with Robyn for a few weeks now and I must say she's an excellent trainer. Robyn is very professional and can train you according to your level of fitness and that's what I like about her. She's always mixing up the workouts which is very beneficial. Robyn is also patient and kind and I would recommend her to anyone looking for a trainer. Working with Robyn has been such an amazing experience and I highly recommend her to anyone. She is extremely knowledgeable, passionate and always listens to my needs during each session. You won't find a more qualified trainer who is dependable and affordable. I am so fortunate to have found Robyn and I look forward to each session with her. She checks all the boxes for what I look for in a elite trainer and I am so fortunate to have found Robyn. I look forward to each session with her and will continue training with her long-term.